MANILA, Philippines – Nine (9) Gilas Pilipinas players got ejected from the game after a mad brawl erupted between Philippines and Australia. The Aussies wrapped up the Asian Qualifiers’ Third Window with a win 89-53 on Monday, July 2, 2018 at the Philippine Arena in Bocaue Bulacan. Blindsided by Japan three days ago, Australia was eager to bounce back against Gilas Pilipinas. Led by Milwaukee Bucks duo, Matthew Dellavedova and Thon Maker switched to attack mode as soon as they took the possession off the opening tip. On the other hand, NBA veteran and naturalized Filipino Andray Blatche, put the Philippines on the scoreboard with a back-to-back treys. Despite the scoring barrage from Blatche, the Aussies held onto their lead for quite some time. The insertion of Terrence Romeo and June Mar Fajardo gave Philippines a chance to lower the lead after the first 10 minutes of the game. 23-18 still in favor of Australia. The start of the 2nd quarter wasn’t that good for Gilas as the Boomers escalated their lead to a dozen with Dellavedova and Maker enjoying a breather on the bench. The Filipinos had outrebounded the Australians but the latter kept pouring it from the three point territory that paved a way for a 17-point lead with over 4 minutes left in the quarter. Fajardo was playing an exceptional basketball all throughout the 1st half until he got into foul trouble at the 1:38 mark after the referees whistled him for an offensive foul. “The Kraken” sat down with 10 points while nursing his 4 personal fouls. Philippines had a decent run in the dying moments of the 2nd period but the mighty Aussies stood their ground led by shooter Daniel Kickert to post a 52-37 advantage entering the third. Gilas Pilipinas welcomed the 3rd quarter with a bunch of turnovers and gave the Boomers an opportunity to create a 20-point margin. Everything wasn’t going right for team Philippines. Aside from the costly turnovers and defenselessness, the nationals were shooting poorly everywhere on the court. With these misfortunes, Philippines was downed by 31 big points. At the 4-minute mark of the penultimate quarter, a massive bench-clearing brawl erupted. Punches, kicks and body slams were thrown by both teams that started from a trash talk between RR Pogoy and Chris Goulding. The game was halted for several minutes as the officials reviewed the game play to look at all angles and penalize all the culprits. After almost an hour of recess, the verdict came out. Nine (9) Players from Philippines were thrown out while four (4) from Australia were ejected. With an 8 vs 3 situation, the game carried on. Baser Amer, Gabe Norwood and June Mar Fajardo played their hearts out against the taller Aussies. 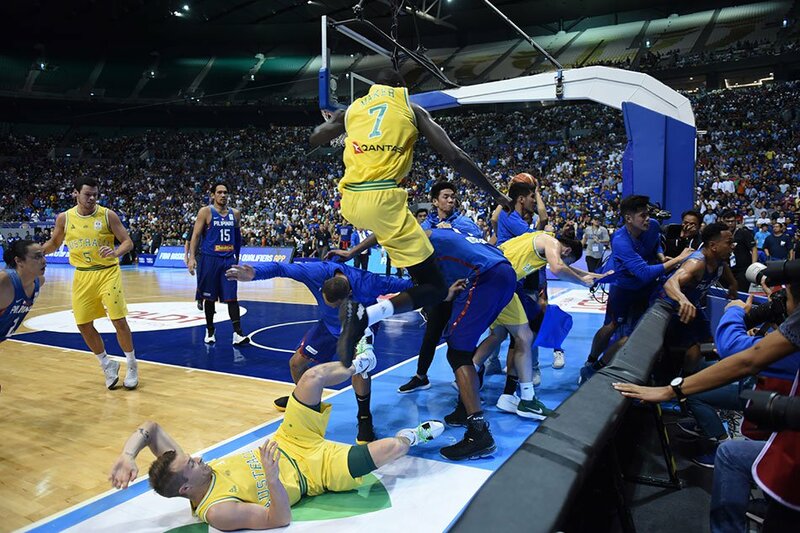 READ: OPINION: Gilas Pilipinas-Australia brawl. Who’s really at fault? Fajardo gave his last foul followed by Norwood that left Amer solo on the floor. Few seconds after Gilas’ last two players left due to foul exhaustion, the game was called over even though there’s one more quarter to go. 89-53 is the final score with Australia winning the game and topping the division. Philippines despite the loss still advances to the next stage not unless a sanction will be imposed by FIBA due to this unfortunate incident.